Published on January 14, 2019 in Digging for Dirt and National. Closed Tags: Bipartisan Policy Center, Bonneville Power Administration, Bureau of Reclamation, construction, construction industry, contractors, Energy Information Administration (EIA), environment, EPRI, FERC, infrastructure, PFAS, Short-Term Energy Outlook (STEO), Tom Ewing, Tom Ewing's Environmental Update, U.S. Army Corps of Engineers, water. * Last October, President Trump issued a Presidential Memorandum titled “Promoting the Reliable Supply and Delivery of Water in the West.” It set streamlining demands for major western water projects, including work underway within the Columbia River Basin – more specifically, an Environmental Impact Statement and Biological Opinion originally due in 2021. The President said: too slow, git-‘r-done faster. Last week the co-lead agencies – U.S. Army Corps of Engineers, Bureau of Reclamation, and Bonneville Power Administration – announced that their plan to speed things up was approved by the White House Council on Environmental Quality. Work will be finished next year – 2020. “The agencies now are revising project details in order to reach the new completion date.” It looks like the work pace quickens for tasks related to “Public Comment Review and Synthesis” and “Prepare Final EIS and Identify Preferred Alternative.” The final EIS should be out in June 2020 rather than the previous, much more exact deadline of March 26, 2021. * Next week, the Energy Information Administration (EIA) will release the findings of its Annual Energy Outlook 2019 (AEO), including long-term projections of U.S. energy supply, demand, and prices, including cases that address alternative assumptions regarding U.S. economic growth rates, domestic energy resources and technology, and world oil prices. Additionally, EIA will present its January 2019 Short-Term Energy Outlook (STEO). This news release will really be an event, a presentation, and discussion by top EIA officials followed by an expert panel discussion on the issues within the new Outlooks. Panelists are from the Bipartisan Policy Center, EPRI and FERC. * PFAS* monitoring continues in Michigan. State and County officials retested 21 private residential wells in Otsego, MI. Fortunately, there was no presence of fearsome dioxins in most of the wells that had previously tested positive. Only one well showed trace amounts – the highest level was 0.13 parts per quadrillion (ppq), far below drinking water standards. Wells were tested for PFAS around the former Menasha Corporation Landfill in Otsego. Good news: All residential well samples came back negative for PFAS. This investigation continues. Next phase: testing soil samples for dioxins and PFAS. *”PFAS,” or PFAs,” is an acronym for perfluoroalkyls, which are a group of man-made chemicals that are not found naturally in the environment, according to the Centers for Disease Control (CDC). These are industrial chemicals used in manufacturing. Published on January 15, 2018 in Digging for Dirt and National. Closed Tags: Bureau of Ocean Energy Management (BOEM), clean water, construction, construction industry, contractors, Department of Energy, DOE, drinking water, EPA, groundwater, infrastructure, Michigan Department of Environmental Quality, Michigan DEQ, perfluorooctanesulfonic acid (PFOS), perfluorooctanoic acid (PFOA), safety, Tom Ewing, Tom Ewing's Environmental Update, water. * News from Michigan about two contaminants found in groundwater used for drinking water. The report forced the anguished question: just how isolated or singular was MI’s struggle with lead, or is lead just one element in a witches brew with other poisons only awaiting discovery? The contaminants are perfluorooctanoic acid (PFOA) and perfluorooctanesulfonic acid (PFOS), ubiquitous compounds used in everything from carpets to insect baits to dental floss. Companies are phasing out production but exposure is widespread. Some good news: recent data indicates declining levels in human blood. Health effects? No solid evidence about any one thing. Last week Michigan DEQ set a drinking water criterion for the compounds: 0.07 μg/L (70 parts per trillion), based on an EPA health advisory. With a standard in place, the state can now take legal action against polluters. 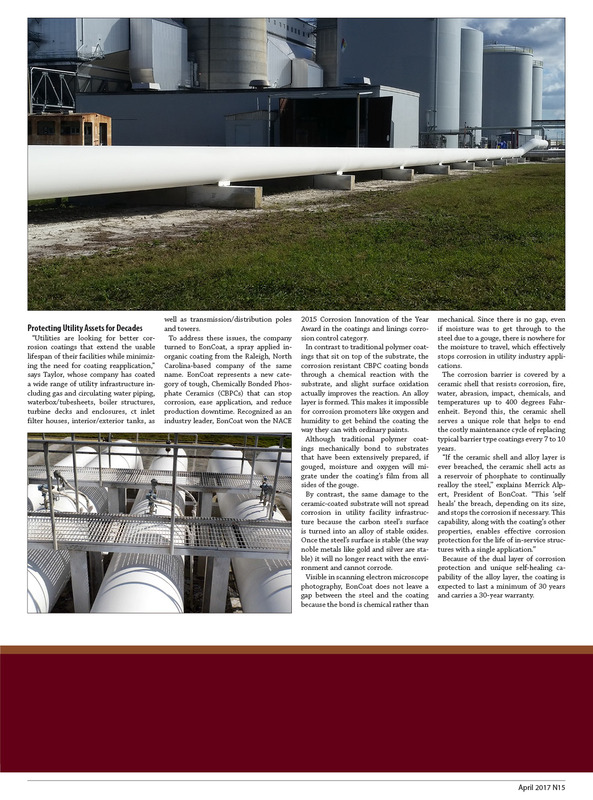 * The Bureau of Ocean Energy Management (BOEM) announced draft guidelines for the use of a “Design Envelope” approach in Construction and Operations Plans (COPs) for offshore wind energy facilities. BOEM says developers wanted this design approach, standard in some European countries for permitting processes. The change gives flexibility in certain project-design decisions—e.g., which turbines to use—at a more commercially advantageous time in the development process. BOEM writes this change results partly from the Administration’s regulatory streamlining work; it could reduce redundant environmental reviews while still maintaining appropriate safeguards. The agency holds an introductory webinar end of January. * Department of Energy (DOE) and many other agencies started to make available their semiannual Unified Agendas of Federal Regulatory and Deregulatory Actions (Agenda), including Regulatory Plans. The Agendas are a government-wide compilation of upcoming and ongoing regulatory activity, including a brief description of each rulemaking and a timetable for action. The Agendas also include a list of regulatory actions completed since publication of the last Agenda. One important rulemaking under development at DOE is called “Modifying the Energy Conservation Program to Implement a Market-Based Approach.” Last November, DOE published a request for information on how this idea might work. Comments are due in February. Published on April 9, 2017 in Featured Article and National. Closed Tags: construction, construction industry, contractors, Corrosion, economy, electricity, gas, infrastructure, NACE, telecom, water. Published on August 3, 2016 in Daily Dirt and National. Closed Tags: AASHTOAmerican Association of State Highway and Transportation Officials, ABC, Amusement & Recreation, Associated Builders and Contractors, commercial, communications, conservation, construction, construction industry, contractors, economy, Education, employment, equipment, health care, lodging, manufacturing, non-residential, nonresidential, office, power, public safety, Religious, residential, roads, Sewage and waste disposa, transportation, water. 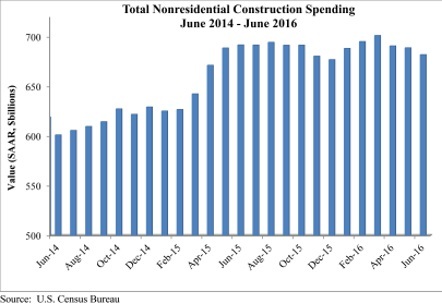 Nonresidential construction spending dipped 1 percent in June and has now contracted for three consecutive months according to analysis of U.S. Census Bureau data released today by Associated Builders and Contractors (ABC). Nonresidential spending, which totaled $682 billion on a seasonally adjusted, annualized rate, has fallen 1.1 percent on a year-over-year basis, marking the first time nonresidential spending has declined on an annual basis since July 2013. “On a monthly basis, the numbers are not as bad as they seem, as May’s nonresidential construction spending estimate was revised higher. However, this fails to explain the first year-over-year decline in nearly three years,” said ABC Chief Economist Anirban Basu. “There are many forces at work, most of them negative, with the noteworthy exception of construction materials prices, which are down on a year-over-year basis. To the extent that savings are being passed along to purchasers of construction services, spending would appear lower in dollar terms than when measured in physical terms such as square footage. “Thanks in part to the investment of foreign capital in America, spending related to office space and lodging are up by more than 16 percent year-over-year,” said Basu. The global economy is weak, and international investors are searching for yield and stability. U.S. commercial real estate has become a popular destination for foreign capital. However, the weakness of the global economy may also help explain the decline in manufacturing-related construction spending of nearly 5 percent for the month and more than 10 percent year-over-year. 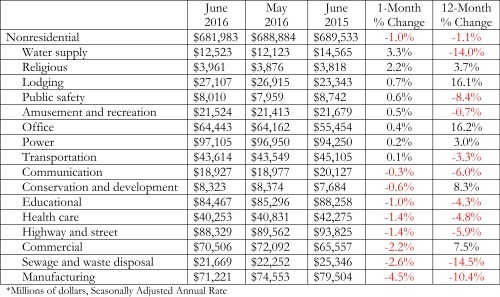 Precisely half of the 16 nonresidential subsectors expanded in June. Two of the largest subsectors—manufacturing and commercial—experienced significant contractions in June, however, and were responsible for a majority of the dip in spending. Tepid spending by public agencies also continues to shape the data. Despite a monthly pick-up in spending, water-supply construction spending is down 14 percent on a year-over-year basis. Public safety construction spending is down 8.4 percent from a year ago, sewage and waste disposal by nearly 15 percent, highway and street by about 6 percent, education by 4 percent and transportation by more than 3 percent. Published on September 20, 2010 in Digging for Dirt. Closed Tags: American Recovery and Reinvestment Act, bridges, clean water, construction, construction industry, contractors, economy, gas, heavy equipment, highways, infrastructure, safety, sewer, stimulus bill, Stimulus Package, underground utilities, wastewater, water. The explosions were horrifying. A quiet residential subdivision south of San Francisco was consumed by a massive fireball in the early evening of September 9. Firefighters who rushed to the scene initially thought that an airplane had crashed into the neighborhood. No airplanes crashed, but the thought was understandable. By the time the fire was contained, fifteen acres of suburban San Bruno had burned, with thirty-seven homes destroyed. Within one week, six people were confirmed dead and more than four dozen were hospitalized. The damage to people and property was on a scale of an air tragedy. The cause of the fireball was not an airplane, nor a bomb, but the kind of infrastructure Americans reply upon every day to feed our creature comforts. The fuel for the explosion was natural gas, the gas San Bruno residents relied upon to heat their homes and light their stoves. A pipe built in 1956 to deliver that gas had ruptured, releasing highly flammable fuel into the air. While an investigation into what triggered the fireball is ongoing, residents had complained for years about possible leaks producing odors in the neighborhood. The tragedy in San Bruno should draw our attention to the infrastructure upon which we rely every day. 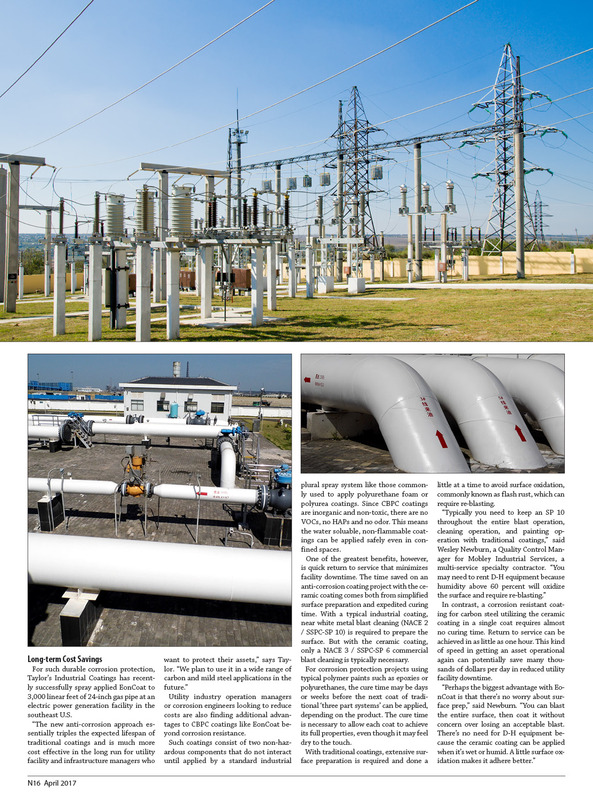 Millions of homes across the United States are woven together in networks of pipes and wires that deliver heat, electricity, and water to us. Almost every day, this infrastructure serves us so efficiently that we do not notice the dire toll of age and use. Rarely does it fail us on the scale that it did in San Bruno. It does happen. One January day in 1992, a similar explosion ripped through several apartment buildings on the northwest side of Chicago, killing four people and injuring many more. In the weeks after that explosion, local and national news reported that the sixty-eight-year-old gas mains that produced the explosion were of the same age and type of those found in several other areas of the city, leading to a wave of “around the clock” (in the words of a People’s Gas spokesman) inspections and replacements of pipes in the months ahead. Chicago received another reminder about the vulnerability of its infrastructure a few months later. In April, contractors working in the Chicago River inadvertently punctured the ceiling of a forgotten freight tunnel below, causing over 100 million gallons of water to flood into the sixty-two-mile tunnel system feeding into the basements of office and retail buildings and knocking out gas and electricity service to much of downtown. Fortunately, no one was injured, but property damage in the Great Chicago Flood exceeded $1 billion. The unusual disaster made international news for days as workers struggled to remove the water pouring into the city’s central business district. The freight tunnel through which the water poured was forgotten because few in 1992 remembered that Chicago had once used freight tunnels underneath the city. The tunnel system under Chicago’s downtown was built at the start of the twentieth centu\ry to transport coal and solid waste via rail to and from the buildings without clogging the above-ground streets. Changes to heating and plumbing led to the end of freight traffic in the tunnels by 1960, and the tunnels became conduits for power and gas lines. What remained beneath the city’s streets lay forgotten. Our gas mains may not be as utterly forgotten as the freight tunnels were, but they are taken for granted. What happened in residential communities in Chicago in 1992 and San Bruno this year is possible in countless communities across the country. 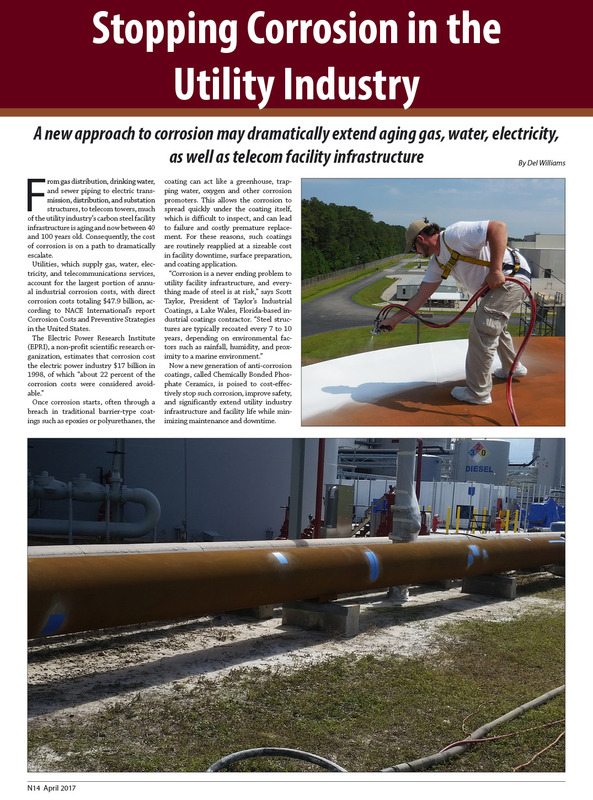 In areas of the United States ranging from Boston to Los Angeles, the networks of pipe branching through cities and suburbs were laid between half a century and a century ago. When we think of gas, it is usually in relation to our monthly utility bills, or in relation to our thermostats and stoves. Few households use stoves more than fifty years old, but those stoves may well be connected to pipes far older than that. Utilities do perform inspections of their infrastructure but Pacific Gas and Electric conducted regular surveys of its pipes in San Bruno without revealing signs of wear or decay. No doubt depositions in future court actions will reveal the number and thoroughness of those inspections, especially given residents’ recent documented complaints. The gas mains in San Bruno are only in the news because they failed spectacularly. Those of us who live “on the grid” in metropolitan America are completely dependent upon this mass of technology that sustains our homes and businesses. Most of us do not give it a second thought unless service is disrupted. Remembering the infrastructure beneath us enough to understand the rigors we put it through and ensure it is properly maintained should not be difficult. We may better understand (to paraphrase historian Harold Platt) our society and culture by studying the historical processes that led to the building and maintenance of our infrastructure. Highly engaging books about the development of networks of pipes, corridors, and wires in the industrialized world include Platt’s The Electric City: Energy and the Growth of the Chicago Area, 1880-1930; the volume Technology and the Rise of the Networked City in Europe and America, edited by Joel Tarr and Gabriel Dupuy; and Mark H. Rose’s Cities of Light and Heat: Domesticating Gas and Electricity in Urban America. These books should appeal to a larger audience than engineers and urban designers, as they reveal not only the mechanics of infrastructure development but ways in which social and economic forces have shaped where infrastructure is built, how well it is built, and how it is (or is not) maintained. Decisions made decades ago shape even today who gets access to modern amenities, what those amenities are, and the risks we take to enjoy those amenities. Urban environmental history provides us an understanding of how our modern infrastructure developed and what the potential risks are. Our challenge is drawing upon that knowledge to ensure that oft-neglected infrastructure is maintained to serve us safely and effectively. At Chicago’s Roosevelt University, we have recently developed a sustainability studies major that uses the history of the metropolitan area to discuss present and future efforts to make the systems managing water, waste, energy, food, and transportation safer and more equitable for people and biota affected by the region. This is but one of many possible approaches to using history that may elevate our awareness of infrastructure and its risks. Chicago’s infrastructure failures in 1992 made news for a while and then receded from public memory. Let us work to ensure that the tragedy in San Bruno allows us to develop a better understanding of the networks beneath our feet.